There are two scenarios where you will need to move teams to a different competition. Each process will be discussed for when you need to use them and steps on how to move them correctly without affecting your competitions, members or statistics. Teams cannot be deleted from competitions- only moved out or made inactive. 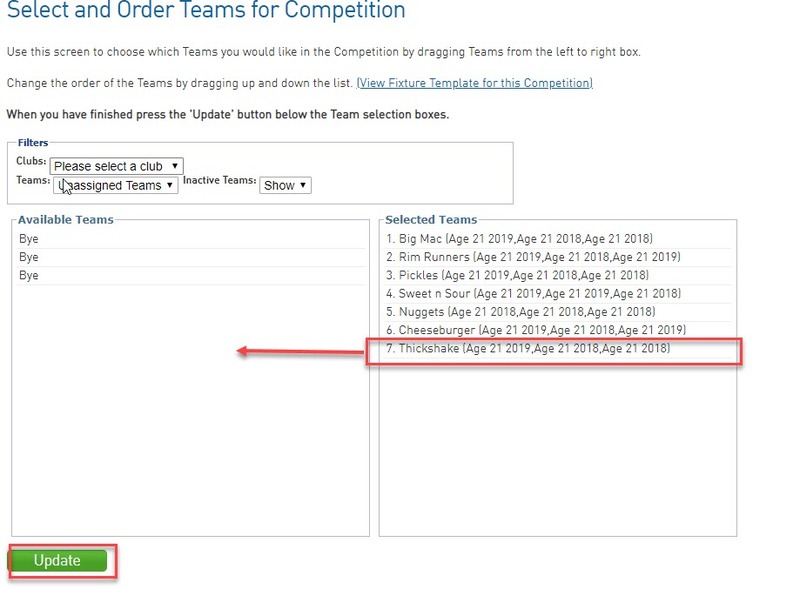 If teams need to be in a different competition you will need to move them out of the competition and into the new one, however if the team is not needed anymore and doesn't belong to a competition you can make it inactive by clicking the check box next to the team name when viewing the team list at association level. BEFORE THE SEASON - MOVING TEAMS TO THE CORRECT COMPETITION IF ACCIDENTALLY REGISTERED TO THE WRONG ONE. 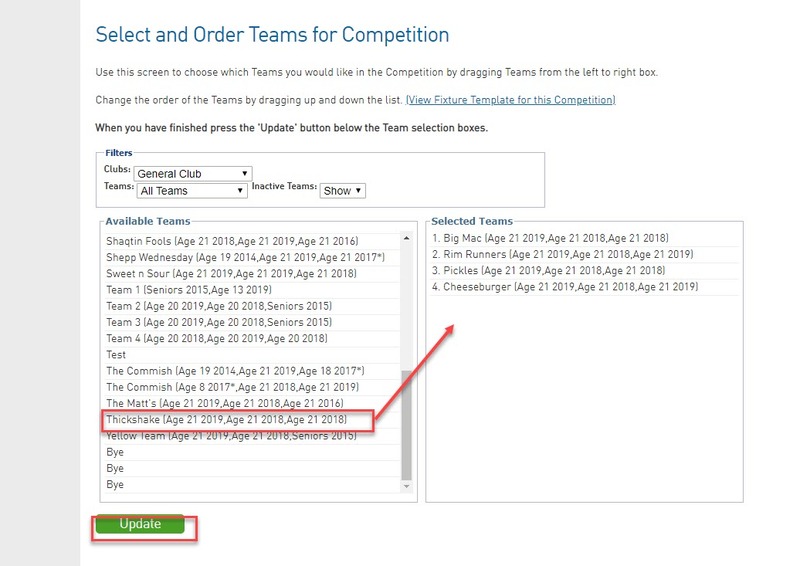 You will use this process if your season has not started yet and you have accidentally registered teams to the wrong competition and they need to be removed into the correct competition. 3. Then select the manage teams in competition option. 4. Move the team from the selected teams list to the available teams list and then click update. 5. You can now go into the correct competition that the team needs to be in and repeat steps 2 and 3. 6. You will need to move the team from the available teams list to the selected teams list and click update. Note: you will need to find the team via the club they are linked to - if the team is not linked to a club you will need to do so before you can assign them back. Admins would use this process during the season when they need to move or regrade teams into a different competition. During the season the team will already have members are if games have been played they will have results and statistics so you need to ensure that the regrade function is used so this information is not affected and is moved to the new competition. If this process is not used teams will not be moved correctly and you will need to manually add in any missing members or statistics. If you are wanting to remove teams from a competition completely and not wanting to assign them to another competition please see how to do this via the steps below. The team is no longer part of that competition.